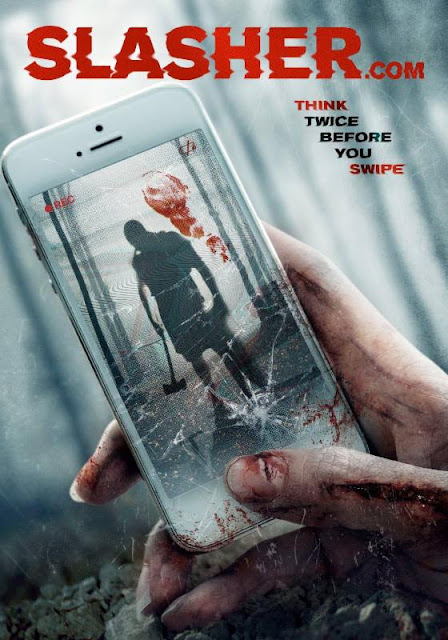 MuchoMuchoMucho Productions and Firefly Films have released a new trailer and art for their new film 'SLASHER.COM' The latest feature from horror director Chip Gubera (Song of the Dead, Academy of Doom), Slasher.com puts a gruesome twist on the perils of modern dating. Co-written by Gubera and Chelsea Andes, Slasher.com combines the time-honored tradition of young people facing unfathomable horrors in the wilderness with the every day horror of meeting people online. Ben Kaplan (ADDicted, Wingman Inc) and Morgan Carter star as the hapless would-be couple, anchoring a cast supported by R.A. Mihailoff (Leatherface: Texas Chainsaw Massacre III, Hatchet II), Jewel Shepard (Return of the Living Dead) and Grammy winner Delious Kennedy. At a time where online dating could prove fatal, Jack and Kristy decide they're ready meet in person. Aiming for an adventurous first date, they plan a weekend getaway to the woodlands of rural Missouri. While discovering each other, they soon learn of the terrorizing horrors that the forest has in store. Below you can check out the poster and the trailer. 'SLASHER.COM' will tour on the festival circuit, screening next at the Bloody Horror International Film Festival in Ottawa and Grindhouse Planet Film Festival in the UK.